More information about the ultimate corrugated web cleaner? 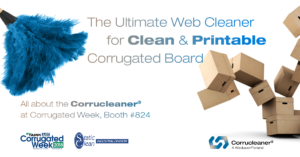 Would you like more information about how the Corrucleaner® corrugated web cleaner can eliminate dust and contamination in your corrugated board production? Get in touch to discuss your corrugated production process and get an estimation of the yearly savings you can achieve by using an effective web cleaning solution. We look forward to hearing from you! Weducon Web & Sheet Cleaning Technology B.V.